Yuna Yang Fall/Winter 2017 show. Aspiring fashion writer Kayla Boyd is rewarded for her longtime passion for style with an invitation to attend the New York Fashion Week. When I was eight years old, I liked collecting weird things: rubber bracelets, skater shoes and basketball jerseys. But, I can still remember the moment that fashion truly became an interest to me. I was in sixth grade, and it all started with a new shirt and hairstyle for picture day. This was one of the first times that I can recall straightening my massively frizzy, long hair (with an actual clothing iron on an ironing board). In addition to the hair, my mom took me to the mall and bought me a long-sleeve Southpole shirt that was black and tan with a gaudy design on the front. Boyd photographed models as they walked down the runway at NYFW. I came into school and everyone obsessed over my hair and shirt. I lacked a lot of confidence growing up because my weight fluctuated; I developed early, and I was pretty shy. But, when I decided to wear something that I felt good in, my clothing changed everything. After that day, I still reverted back to many days of baggy shirts and frizzy ponytails, but when a special event presented itself, I found myself wanting to go to the mall and find clothes and jewelry that actually matched each other. By middle school, it was an everyday thing. I colored my hair, evolved my collection of skater shoes into a rainbow assortment of Nike Air Force 1 shoes and I began coordinating with bright colors and crazy prints. I was hooked. Fast forward past high school, where I was voted “Best Dressed” in the yearbook, to college. I was hesitant about taking up a minor in fashion. I always knew I wanted to be a journalist, but I wondered whether being a fashion journalist was possible and how someone like me does the job. I’m not thin. I’m not rich. I’m not white. Despite all of my hesitation and doubts, I enrolled in the minor. After one year and a trip to New York City, that minor became my double major. I decided maybe I could work in fashion. Now, with a bachelor's degree in fashion and journalism, still focusing on the same goal in graduate school, I finally started to feel like I could do this job. My degrees, my hundreds of clips, and my insane shoe collection (which has now evolved into a variety of Air Jordan sneakers, booties, sandals, and even some heels) did not spark my confidence, but it was my first invitation to New York Fashion Week. 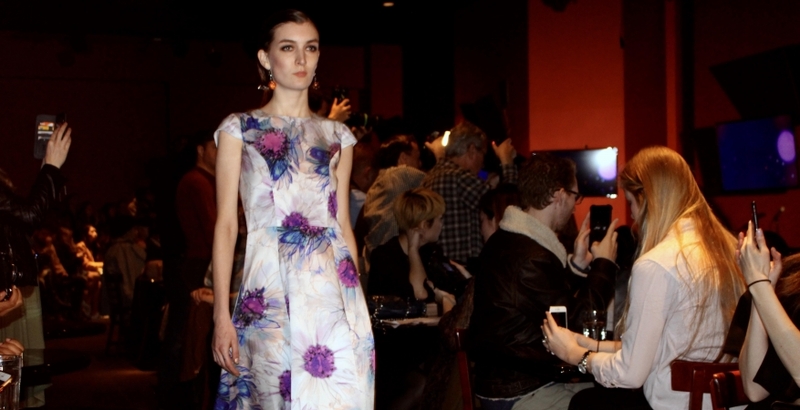 NYFW is a dream come true for any fashionista, style guru, fashion writer, publicist or model. It’s a time to walk around New York City, one of the fashion capitals of the world, and see the most amazing faux fur, designer handbags and luxurious six-inch heels. And maybe, if one is lucky, he or she will get to go inside a show and see a designer’s collection of garments that they’ve slaved over making just for people to admire. With my first invitation to NYFW, I went to the Yuna Yang Fall/Winter 2017 runway show at the Gotham Comedy Club in Chelsea, Manhattan last Saturday. I received an invite on my blog email. I was so nervous to go because I thought I was going to get there and it would be fake or a mistake. I got invited to the show because a high-end designer brand liked my fashion blog. I didn't have any connections, I didn't ask to go and I didn't use one of my publications to get a press pass. I did this all on my own, and it felt amazing. While I was there, waiting for the doors to open, I photographed people's street style and I met other bloggers. After getting invited in, we flashed our phone screens with our invitations and were seated along the aisles of the runway. Live music played, lights twinkled and cameras flashed everywhere as the models looped around the club. As the models sailed past me, I tried to snap as many photos as possible. It was everything I thought it would be. I didn’t have an Yves Saint Laurent bag or Christian Louboutin heels, but I didn’t feel out of place. I was confident in my ability to analyze the collection and walk away with well-shot photographs. While growing up, people always hear that they should “dream big” and “never give up.” But, I'm from Detroit so when I told people I wanted to be a fashion journalist in New York City, a lot of people raised their eyebrows. However, that one fashion show taught me something: you really can do anything you set your mind to. Submitted by Katherine Torres (not verified) on February 18, 2017 - 10:36pm. SHOOT FOR THE MOON EVEN IF YOU MISS YOU'LL LAND AMONG THE STARS!!! Submitted by Kailena Sampson (not verified) on February 17, 2017 - 6:41pm. OMG. I CANT BREATHEEEEEE. HOW INSPIRING. LOVE YOU. AMAZING.